Oh glorious wonderful sleep. How I have missed you! Thank you thank you bed from heaven! I wake up before 6, but lie in bed as long as possible. Despite the early wakeup it was an awesome soft sleep. I reluctantly get up and get coffee from Starbucks, then microwave the tofu scramble burrito I bought yesterday for brekkie. All my things are once again stuffed in my bag and we climb aboard the bus to take us back to the trailhead. Today we are climbing for 8 miles up 3000ft in elevation. The first 4ish goes nice and fast with a stop at water to drink a bunch as it’s a hot day. Then the altitude starts getting spicey. I feel like there are thousands of tiny people with ropes tied to every muscle fibre in my legs that are pulling me backwards and down into the ground. I think for every extra foot of altitude, there has been a dose of extra gravity. Legs. Won’t. Move. Forward. At a little stream I stop to drink a litre of the cool yummy water. My bottle this morning was filed with town water and the chlorine in it was overpowering. Mountain water plus my sawyer squeeze beats any other water ever. I march on, listening to the last of my audiobook, going so so slowly. Another stream break with Grizzly, then up up up. We are both draaaaagging today. We come across a big rock pile with marmots and pikas galore! I love fluffy bummed marmots! I love the pika call! Then we spy some mountain goats in the far distance on patches of snow. Mountain goats! We switchback up over a bunch of false summits, looking down at Breckenridge below. Up across a snow chute, then finally at the top of the pass. WHOOSH! We are nearly knocked off the mountain by the wind on the other side. Amazing views, much wind. Across a ridgeline then down down down a skinny trail clinging to the side of the mountain. Finally below trees we have some relief, and I finally am able to eat something- my breath was too shallow on the way up and the wind was too strong coming down to eat. Through the pine trees, across little streams. Podcasts entertain me as I head down to the river and across a bridge to our campsite, a mere 12.8 miles from when we started. That’s what happens when you leave town late! It’s a bizarre little spot next to a winter carpark for the copper mountain resort, looking up at the gondolas on the mountain with a river rushing by on the other side. Hmmm….finding a private spot for a ‘bathroom’ in the morning wiĺl be interesting! Town day town day today is town day! My mind is excited but my body is sleepy from, wait for it, a crappy sleep. Maybe it’s altitude messing me about, but I haven’t slept well on the trail at all. Maybe a pillow tonight will make it better. We pack up and head up our 2.5 mile climb, the only real climb of the day. I divide my day and mileage by climbs, bumps and water sources. Today is a climb, a bump, water, then one last bump before descending downhill to the highway to Breckenridge/ Frisco. The climb is beautifully switchbacked so we aren’t doing anything too steep. We pass Marty on the climb up. “I didn’t think I’d see you guys again” he says in his thick Georgia drawl. We met him…day 2? by a stream. He was having a tough time with the altitude and wasn’t able to eat anything. His appetite has returned and now he’ll be smashing miles – he was using the AT as his training ground. Lots of riders zoom by, we pass a few day hikers and other CT hikers, everyone looking forward to town. The trail is rocky with thin pine forest either side. We round a bend and we can see the gondolas and runs of the ski resorts nearby. Finally the towns of Breckenridge and Frisco glint at us from the valley and we switchback down down down to food, showers, laundry and rest. I’m clean, laundered and have just eaten some lunch when BOOM! Something grips my abdomen like I’ve never felt before. Simultaneously punching and squashing and burning. Ow ow ow ow ow. I have no idea what it is and emd up lying on the floor trying to contort my body into a position that doesn’t feel like I’m going to die. What on earth??? After about 45minutes it subsides. I have no idea what brought it on but I hope it doesn’t come back! In a sleepy daze I wander about natural grocers and buy my resupply food – probably the best vegan food selection I’ve ever seen. I buy a giant salad from whole foods and some fruit- I’m attacking whatever is in me with an A bombs worth of fibre. Back in the hotel I lie on the most magnificent bed I can remember lying on. Fluffy awesome pillowy heaven. I watch 2.5 movies, have a long bath, look at all of the internet, then sleeeeep. Nero-ing like a boss. It’s morning already. We successfully pretend we don’t hear the alarm for half an hour. “I could sleep for another 2 hours” I groan. “Me too” says Grizzly. But we can’t. This morning we have to hitch in to Jefferson to collect our little baby box of supplemental food to get us to Breckenridge, and my new frogg toggs. We pack up in record time and are in Jefferson by 730, just after the store opened. The frogg toggs are made from some strange fabric that is not normal rain gear material, and feels like it could rip in an instant. That’s what you get for 10.4 oz (pants and jacket together!). We stuff around charging things and trying to get service on the wifi to book a room in Breckenridge. It’s the weekend and everything is booked or impossibly expensive. Gah I hate the Aussie dollar. Room booked we hitch with a criminologist who visits Australia about 6 times every year advising on policy and as part of university faculty. We fill our water bladders at the campsite, empty our other bladders in the pit toilet and finally at 9am we are off. The trail is busy today with hikers and bikers. We pass one guy packing up who zooms up the trail and hikes with us for a while. His name is Hashtag and he’s planning to hike a mini calendar triple crown. A calendar triple crown is hiking the Appalachian Trail, the Pacific Crest Trail and the Continental Divide Trail all in one year. There are 2 uber hikers currently chasing it this year. The mini triple is the Long Trail, the Colorado Trail and the John Muir Trail. I’ve not thought of doing this before, and it sounds freaking amazing. I don’t know if it actually has an official name, but I dub it the mini triple crown because each of these trails spends a chunk of their miles on the big 3. A lovely flat spot by Jefferson Creek is early lunch. We fill up on water as there isn’t any marked on the next climb – 7.3 miles up 1876ft to 11873ft. As we climb and climb the clouds gather above. The incline is gradual and it would be amazing if all passes were like this but we are hot and sweaty nonetheless. The cloud cover is awesome…just need to cross fingers that they don’t explode above us and we don’t turn into lightning rods at the top of the pass. Up up up up. Through the trees on the beautiful flat wide path that is meticulously maintained. We break through above treeline, pass some snow patches, with a towering circle of rock on our left that once upon a time would have been a cirque glacier. “I’m sorry glacier” I say as I pass as it’s probably our stupid human overconsumption and planet warming that killed it. “Rumble rumble!” Say the clouds as we hike “RUMBLE RUMBLE!” Eeps I’m trying to hike fast through the un-aired air. Finally we are at the top and have out run the storm which is now unfurling on the valley below. A beautiful field of wildflowers stretches out around us. Over the pass and starting down the otherside we see something strange. “Is that a car?” There is a road right at the top. “Bugger we could have driven? We didn’t have to walk?”. “Trail magic!” a man yells from a clearing next to the trail. “Help yourselves”. We each grab a beer and sit down to chat. There are 4 people dishing out trail magic at the top. 2 hiked the CT last year so they are paying forward tbe generosity they received. So many awesome points for the location of this trail magic! We cuddle their dogs and chat about their plans to hike the overland track in Tassie next year. We have miles to cover so we hike on. We are actually back on the CDT now! The CDT and CT have joined forces right at this pass. As we start hiking it becomes apparent that I have very low tolerance for beer at altitude. It was a light beer. Holy poo I’m very tipsy. I stumble down the trail and figure seeing as I can’t really feel my feet, or pain, I may as well go faaast. I zoom for a time, sobering up as we go down the long descent. At the bottom we rest and I lie in the dirt with my feet raised on a log. A few more miles to go and I put on my audio book. Grizzly pokes me with his hiking pole to get my attention. There is a strange set of buildings and objects below the trail. Sled dogs we realise. Poor dogs are crying out, clearly bored or unhappy. One poor dog is chained to a pole and is circling circling circling. “I’m sorry dogs!” I yell. It’s sad and I put my headphones back in so I don’t hear them crying as I hike. Another pretty river crossing and we are in a village! A tent village! It’s the weekend, we are near a road and everyone has come to the wilderness. Its a really cool campground that is more forest than road, with babbling streams running through. We decide to camp just beyond this little makeshift town and find a spot a little ways up the hill. We were planning on a few more miles but both of us are feeling a little weird today. Altitude? I go to blow up my sleeping pad and have to sit down from a weird kind of dizzyness. Altitude is the culprit I decide. I put on Owly (my amazing Owl beanie that is perfectly cozy and comforting), drink a litre of water and feel much better. Tonight is chana masala night! This is very exciting. Nothing in my food bag is appealing today and chana masala will hit all the spots perfectly. The last of the light fades over the snow topped mountains beyond our little private meadow. We lie in the tent with full bellies hiding from the bitey flying things listening to the stream babble babble babble nearby telling the world all the stories it heard and saw today. Goodnight stream! Goodnight meadow! Goodnight Owly! I sleep terribly, waking at 1am and unable to get back to sleep for hours. I’m too hot, then too cold, then I have no idea what the problem is but sleep doesn’t come. We wake late, but the rest of the campers are all still in camp. Ah, I think, JMT style hiking. I spend too much time looking for a missing sock, that I decide a squirrel must have run off with. It ends up being tucked into the back of my leg sleeve. 8am on the trail and through a large long meadow surrounded by pine trees, reminiscent of the walk out of Kennedy Meadows. It’s sunny and cool and we manage to crank out 3.5 miles in the first hour. Then it all goes sloooowly. We don’t have to hike fast or hard today- we have a box to be picked up in the tiny town of Jefferson which is just 23 miles from camp. We can either hike fast and try and hitch in tonight to get it, or hike as slow as we please to the road, and hitch in early in the morning. We decide to just hike and see what happens. There isn’t too much climbing today – a long easy climb over many miles, then undulating for the rest of the day. It gets hot all of a sudden, and we are climbing in a place with no air. Not enough air in the air at 11000ft. We stop at a stream for early lunch, fill up water and drink a lot. We need to make sure we are drinking lots with the altitude, the heat and the climbing. The app isn’t too accurate with the water sources, so we find ourselves panicking about not enough water when there is plenty. Drink a litre, take a litre at every stop. Another little break by water in the afternoon. I dip my buff, hat and bandana in the cool stream and enjoy the ice cold shock as it hits my skin. My audiobook does a great job at distractinge from the heat and I zone out listening to it as we go up and down, up and down. One more little climb through the narrow forrested trail and we open to a magificent view of a meadow with snow peaked mountains looming. Mountains! Views! We will be off our tame few days of trail soon and into the tough climbs and altitude of the Rocky Mountains. It turns out we actually have made good time and will only just miss the store. Bugger! We race down to the trailhead just in case, but admit defeat at 550pm when we come across…trail magic!!! Corbin and Harold have been here all day cooking hot dogs for hikers. We eat some bags of chips and add some arnold palmer powder to some water bottles and chat to the other 4 hikers hanging around. Camping is stealth camping near the campground-we don’t want to pay the fee but need to stay near the road to hitch in the morning. We set up the tent, boil some water and use the silver dinner packet from a couple of nights ago to heat and cook our ramen, veggie and miso soup creation. “Should we rinse it?” I ask, peering into the bag and seeing remnants from dinners past. “Nah” decides Grizzly. Salty salty goodness. We dive into the tent, careful not to let in any mosquito hitch hikers. It’s early so we take our notes then while away time watching videos on tiny screens. Hopefully a good sleep tonight! CDT Day 60 CT Day 1 – Hike Time! Wake up wake up! It’s Colorado Trail Day! We’re up and out by 7am, getting a ride to Waterton Canyon, and on the trail just before 8am. It’s strange having a trail head so close to the city, so close to houses. The trail is a dirt road for the first 6.6 miles, following the Platte river with lots of pavilions and pit toilets dotted along the roadside. For the first time this year I’m feeling fast! We pass little groups and pairs of hikers. I want to give them pack shakedowns as a lot are not looking happy with their heavy heavy packs. My ego is definitely happy with the CT decision. It’s ridiculous and means absolutely nothing, but I allow my head to swell nonetheless. Overhead clouds are rumbling and grumbling. This is not good news- I ditched my heavy goretex rain gear (that I was carrying through Glacier) in Denver and my new gear won’t get to me until we get to Jefferson in 3 days time. They start to spit a little and I run faster and faster down the switchbacks to the river. There is a toilet there which means at least a little awning to hide under. It starts raining harder and I run down down until I’m there. Under the awning is the most revolting collection of rubbish I’ve ever seen at a trailhead. There are 3 overflowing garbage bags, another inside the room, as well as things no one ever needs to see smeared on the floor and seat. It’s bucketing down and the awning has just enough room for us to hide for 10 minutes while this cloud explodes. The rain has done it’s afternoon thing, we gingerly step back onto the trail, cross the river and collect some water – our last for 13 miles. Climbing up the mountain, the trail spits us out into a burn area. Very exposed. Very hot. Gah I knew I should have taken more water. I start getting worn out from the sun, but keep plodding on and miraculously keep passing people. We pass 17 hikers in total (although one sneaky bugger trotted past as we were making dinner). Our arbitrarily chosen campsite mile is crappy for camping, so we keep going a little ways and find a spot that will do. We’ve turned into bougie campers and have added a stove to our arsenal, so it’s hot Kathmandu curry for dinner tonight! Nom nom. After dinner we lie in the tent with the rain fly off, listening to Lord Huron, Mumford, Lumineers, and somehow Warren G, watching the clouds turn into animals and fairies and blobs of nothing as we melt into our sleeping pads. Just as the last pink and orange light is fading away from the clouds, the yip yip of coyotes starts up not too far away. Oooh I’ve missed them yipping me to sleep! It sounds like a full family outing- so many different voices joining in the chorus. Grizzly and I will be heading off in the morning to start the Colorado Trail / Continental Divide Trail just outside of Denver, heading south. The CT and CDT intersect roughly from just near Breckinridge until around Silverton in the south of Colorado. The CT then finishes in Durango while the CDT continues SE via Wolf Creek Pass and into New Mexico near Chama (and on to the border). Right now we are hoping to complete the whole CT, then get a ride to Cuba in New Mexico where I finished when NoBo on the CDT, completing the remaining parts of the CDT in Colorado (getting hitches and rides from amazing people where necessary to connect the trail), then NoBo to Wyoming! 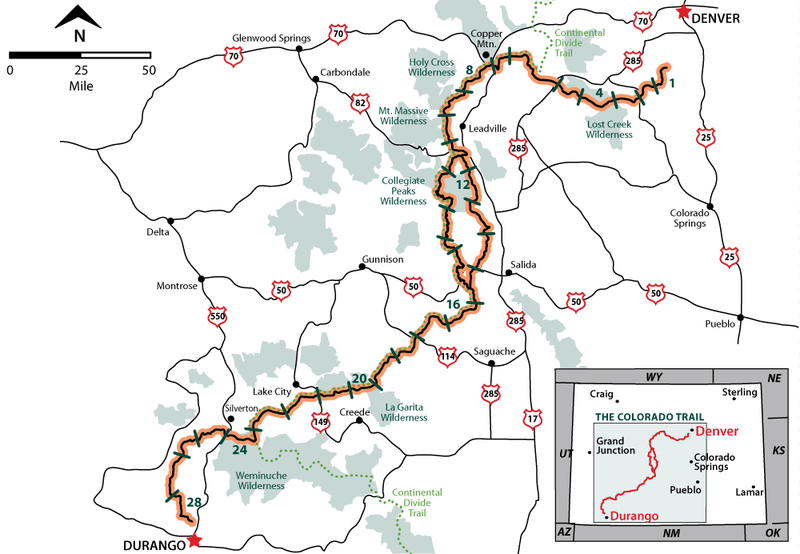 For more information on the Colorado Trail, check out this webpage. I’ve updated some of my gear for the Colorado Trail, which you can take a look here on the lighterpack page. Any questions or comments I’d love to hear from you! If you are in Colorado during the next month please be sure to drop me a line!